Help Us Spread Peace And Social Justice! Progressive Democrats of America (PDA) National Advisory Board Member and internationally honored peace activist Media Benjamin needs our help! Please donate generously now to support this tour, and to help PDA keep our peace organizing front and center in our work. We have a very limited number of signed copies of Medea's latest book. Donate $100 or more and we'll send you a copy as our thanks! 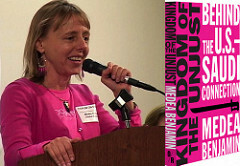 Medea, a co-founder of Code Pink and activist/author, has written a new book, Kingdom Of The Unjust: Behind the Saudi-US Connection. We're sponsoring a national book signing tour for her, and we hope you will help us get this vital message out with a generous contribution right now. With our help, she'll travel nationally to speak with and inform activists all across the USA. All this travel will cost $ thousands. We need your help right now. Please help fund Medea’s peace and information tour. We won't get big money from billionaires or super PACs. To win, we need help from small donors and activists like you! We welcome contributions of any size. Sign up to make automatic recurring monthly contributions.